When you see a boat skimming across the water headed toward a dock to fill up with gas, a pontoon boat gliding safely into a slip as a person stores gear into an onboard storage compartment, or a live well filled to the brim with bubbling water and minnows, you may be watching people enjoying products made lighter, more functional and durable, and safer through the innovation of rotationally molded components. Today, We have in excess of 1.5 million plastic fuel tanks in the field serving numerous industries. In addition, We supply a variety of custom rotationally molded products in the marketplace. Some of these products might be found right in your own home, such as the fuel tank on the lawnmower, a utility container in your garage or the protective case used for golf clubs when you fly. Per engineering specifications, Inca is able to build into, or install, any component needed to complete the product, such as a sending unit, pickup tube or other parts. Inca uses first-class parts to insure that dependability, reliability and serviceability be built into every tank. Standard part options include pickup tubes (both rigid and flex), straight vents, 90-degree elbow vents, T vents, anti-siphon valves of various size pressure settings and manual shut-off valves. 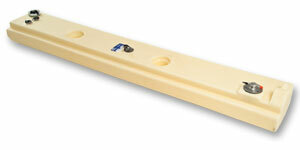 Standard brackets are available, primarily made of aluminum and PVC. Other hold down systems are used to accommodate specific applications. Inca can customize your tank to receive the bracket of choice. 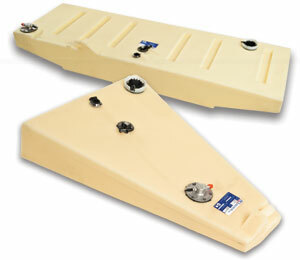 Our Molded Products have pioneered the development of custom rotationally molded plastic fuel tanks for the marine industry. To date, Inca has manufactured over 1.5 million fuel tanks for marine, agricultural,and industrial use. With fuel tanks manufactured in all sizes and shapes, the company has produced fuel tanks ranging in size from 1 gallon to 195 gallons. We have been designing and manufacturing rotationally molded seats for the marine industry since 1979. In addition these seats can be used in a variety of other applications, including agricultural and construction equipment, outdoor furniture and playground equipment, lawn and garden equipment, recreational vehicles and utility vehicles. Storages boxes and bins and specialized containers can be manufactured in all shapes, sizes and colors. Inca is able to incorporate ribs and cones for additional strength and support, special hinges and fittings, and design for hold down, as well as customizing the product to fit into tight spaces. In addition these storage boxes can be used in a variety of other applications, including agriculture, construction, emergency fire specialized storage, forestry, industrial cleaning, materials handling, outdoor and playground equipment, lawn and garden equipment, point of purchase, recreational vehicles and utility vehicles. • Linear Low Density Polyethylene (LLDPE)—to provide excellent impact strength, flexible to medium stiffness, chemical and environmental stress crack resistance, and ease in processing. This material usually meets the requirements of FDA, USDA and NSF. Water and holding can be customized to be manufactured in all shapes, sizes and colors to fit into available space. The seamless construction reduces the likelihood of rupture or explosion, and the resin will not corrode. In addition these water and holding tanks can be used in a variety of other applications, including agriculture, construction, industrial cleaning, materials handling, outdoor and playground equipment, lawn and garden equipment, recreational vehicles and utility vehicles. • Also Linear Low Density Polyethylene Resins (LLDPE) can be used to provide excellent impact strength, flexible to medium stiffness, chemical and environmental stress crack resistance, and ease in processing. This material usually meets the requirements of FDA, USDA and NSF. Live wells and dry wells can be manufactured in all shapes, sizes and colors. With the flexibility offered through rotomolding, wells can be manufactured to fit into available space. In addition, these wells can be used in a variety of other applications. • Linear Low Density Polyethylene (LLDPE) — to provide excellent impact strength, flexible to medium stiffness, chemical and environmental stress crack resistance, and ease in processing. This material usually meets the requirements of FDA, USDA and NSF.